by Faragher, John Mack; Buhle, Mari Jo; Czitrom, Daniel H.; Armitage, Susan H.
NOTE: You are purchasing a standalone product; MyHistoryLab does not come packaged with this content. If you would like to purchase both the physical text and MyHistoryLab, search for ISBN-10: 0134126718 / ISBN-13: 9780134126715. That package includes ISBN-10: 020596205X / ISBN-13: 9780205962051 and ISBN-10: 0205967779 / ISBN-13: 9780205967773. MyHistoryLab should only be purchased when required by an instructor. 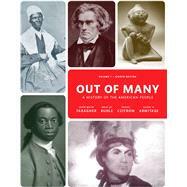 Out of Many: A History of the American People, Eighth Edition offers a distinctive and relevant approach to American history, highlighting the experiences of diverse communities of Americans in the unfolding story of our country. The only American history text with a truly continental perspective, Out of Many offers community vignettes — from New England to the South, the Midwest to the far West — that help students see how diverse communities and different regions have shaped America's past. By focusing on particular communities and regions, Out of Many weaves the stories of the people and the nation into a single compelling narrative that continues to this day. MyHistoryLab for the U.S. History Survey course extends learning online, engaging students and improving results. Media resources with assignments bring concepts to life, and offer students opportunities to practice applying what they’ve learned. And Writing Space helps educators develop and assess concept mastery and critical thinking through writing, quickly and easily. Please note: this version of MyHistoryLab does not include an eText. Out of Many: A History of the American People, Eighth Edition is also available via REVEL™, an immersive learning experience designed for the way today's students read, think, and learn. John Mack Faragher is the Howard R. Lamar Professor of History and director of the Howard R. Lamar Center for the Study of Frontiers and Borders at Yale University. Born in Arizona and raised in southern California, he received his B.A. at the University of California, Riverside, and his Ph.D. at Yale University. He is the author of Women and Men on the Overland Trail (1979), Sugar Creek: Life on the Illinois Prairie (1986), Daniel Boone: The Life and Legend of an American Pioneer (1992), The American West: A New Interpretive History (2000), and A Great and Noble Scheme: The Tragic Story of the Expulsion of the French Acadians from their American Homeland (2005). Mari Jo Buhle is William R. Kenan, Jr. University Professor Emerita of American Civilization and History at Brown University, specializing in American women’s history. She received her B.A. from the University of Illinois, Urbana- Champaign, and her Ph.D. from the University of Wisconsin, Madison. She is the author of Women and American Socialism, 1870—1920 (1981) and Feminism and Its Discontents: A Century of Struggle with Psychoanalysis (1998). She is also coeditor of the Encyclopedia of the American Left, (second edition, 1998). Professor Buhle held a fellowship (1991-1996) from the John D. and Catherine T. MacArthur Foundation. She is currently an Honorary Fellow of the History Department at the University of Wisconsin, Madison. Daniel Czitrom is Professor of History at Mount Holyoke College. Born and raised in New York City, he received his B.A. from the State University of New York at Binghamton and his M.A. and Ph.D. from the University of Wisconsin, Madison. He is the author of Media and the American Mind: From Morse to McLuhan (1982), which won the First Books Award of the American Historical Association and has been translated into Spanish and Chinese. He is co-author of Rediscovering Jacob Riis: Exposure Journalism and Photography in Turn of the Century New York (2008). He has served as a historical consultant and featured on-camera commentator for several documentary film projects, including the PBS productions New York: A Documentary Film; American Photography: A Century of Images; and The Great Transatlantic Cable. He currently serves as a Distinguished Lecturer for the Organization of American Historians. Susan H. Armitage is Professor of History and Women’s Studies, Emerita, at Washington State University, where she was a Claudius O. and Mary R. Johnson Distinguished Professor. She earned her Ph.D. from the London School of Economics and Political Science. Among her many publications on western women’s history are three coedited books, The Women’s West (1987), So Much To Be Done: Women on the Mining and Ranching Frontier (1991), and Writing the Range: Race, Class, and Culture in the Women’s West (1997). She served as editor of the feminist journal Frontiers from 1996 to 2002. Her most recent publication, coedited with Laurie Mercier, is Speaking History: Oral Histories of the American Past, 1865—Present (2009).